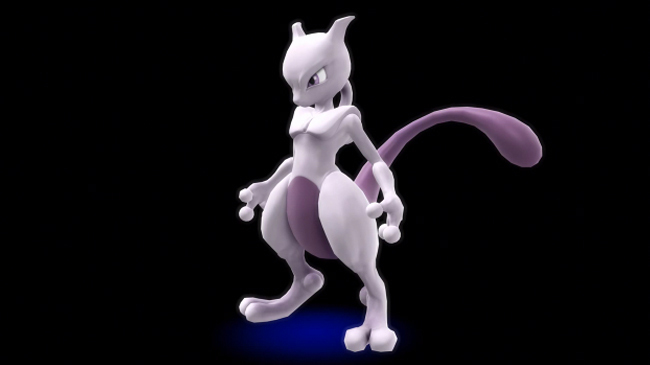 At the end of today’s Super Smash Bros. Nintendo Direct, it was confirmed that Mewtwo will be a playable character – but only if you own both the 3DS and Wii U versions of the game. If you do, then you will be able to download Mewtwo for free sometime around Spring 2015. The livestream also revealed several new details about the upcoming Wii U version of the game. The Smash Tour mode, exclusive to the Wii U version, replaces Smash Run from the 3DS game. In Smash Tour, players will control their Mii characters as they travel around a Mario Party-esque board game. As players navigate the board, they will collect fighters as well as stat upgrades, similar to those in Smash Run. Players will use the fighters they collect to battle whenever two players land on the same space. At the end of the game, everyone competes in a stock battle using their collected fighters as their lives. We also got our first look at Special Orders, the new game mode hosted by Master Hand and Crazy Hand. In this mode, players complete special challenges to unlock new rewards, such as equipment and special moves. Super Smash Bros for Wii U really encourages on-the-couch local multiplayer. Nearly all the special game modes, including Target Smash, Multi-Man Smash and Event Mode, now support co-op. Not only that, but you can now have local battles with up to eight players on some of the larger stages, such as the new Palutena’s Temple, or the fan favorite Hyrule Temple from Super Smash Bros. Melee. Palutena’s Temple, based on Kid Icarus Uprising, will include conversations between Pit and Palutena about each of the other fighters, similar to Snake’s calls in the Shadow Moses Island stage in Super Smash Bros. Brawl. The dialogue can be heard if Pit uses his down taunt while playing on the stage. We also got a glimpse of Great Cave Offensive, a massive stage inspired by Kirby Super Star. This hazard-ridden stage has “danger zones” on the walls, floors and ceilings that will instantly K.O. players with more than 100% damage. Another new stage, Jungle Hijinx, is based on Donkey Kong Country Returns. This stage features both a foreground and background area, and fighters can blast themselves from one area to the other via barrel cannons. In addition to all the stages included with the game, Super Smash Bros. for Wii U also sees the return of the stage builder. Now platforms can be drawn freeform using the Game Pad, allowing much more organic and varied possibilities than the stage builder in Brawl. We also got some more information on Amiibo, the Skylander-like figures Nintendo will be premiering with the new Super Smash Bros. The figures will be able to summon a Figure Player (“FP”) that assists you in battle and can level up to gain smarter AI. Your FP will also be able to earn you rewards such as equipment and trophies. Super Smash Bros. for Wii U will be released on November 21 in North America, and on December 5 in Europe. The full Nintendo Direct is now available to watch on YouTube.